So there I was in Miami last month, stalking a middle-class neighborhood with my binoculars, searching for a red-whiskered bulbul. The bulbul is originally from Asia, but despite its non-native status it’s considered a “countable” species by the American Birding Association. Countable is the key word. I didn’t want the 500th bird on my life list to be questioned by the ornithological records police. South Florida is loaded with exotic birds bearing tropical pedigrees, many of them escapees from pet stores or zoos. Only a few of the imports, like the bulbul, common myna and spot-breasted oriole, are considered to have self-sustaining wild populations. This means birders can add them to their coveted lists and feel no guilt. There were lots of birds among the tightly spaced homes across from Baptist Hospital—mockingbirds, monk parakeets and even a loggerhead shrike carrying a small lizard in its bill. An osprey and kingfisher patrolled the little man-made lake. A hummingbird perched on a wire. But I detected no red-whiskered bulbuls. Back in the rental car, driving to my parents’ home in Key Largo, I had plenty of time to think. Hey, at least I hadn’t been arrested. The streets I’d just finished walking had Crime Watch postings on every block. If there was a sign welcoming binocular-toting birders with pale white legs I missed it. But an even more cooperative rarity would soon arrive. A few days before I left for Florida a varied thrush was spotted in an Evanston backyard. Local reports of this species, an occasional wanderer from the Pacific Northwest, always get my attention. It’s a beautiful bird and closely related to our familiar robin. I’d hoped to see my first varied thrush last summer, during a trip to Olympic National Park in Washington. That’s where you’d expect to see one, but the species can be secretive, especially in summer. No luck. Then, in November, a varied thrush was discovered at Morton Arboretum in Lisle. I went there a day or two after the first sighting, reported to the right place and then along with other birders watched a large flock of robins feed on berries for about an hour. Again, no luck. By the time I returned from Florida the Evanston varied thrush was a genuine sensation. Apparently it really, really liked the backyard on Cleveland Street and the homeowners were perfectly fine with birders stopping by to see it. The yard features multiple feeding stations, all easily observed from the back alley while peering over a neck-high wooden fence. The thrush would periodically visit a platform feeder with sunflower seeds. Now ask yourself, how many people would tolerate dozens of birders looking into their yard from 50 feet away, pointing their binoculars and long-lens cameras directly toward their home? Indeed, serious birdwatchers in this region are incredibly lucky that the varied thrush settled where it did. Jason and Judy Kay, the homeowners, welcomed any and all birders. Jason, who writes a delightful blog called Garden in a City, didn’t know what he had at first. His post on Jan. 27 mentioned a mystery bird and a request for ID assistance. The accompanying photo was clearly a varied thrush and word spread quickly. Four days later, Kay’s blog entry was titled “The Birders are Coming! The Birders are Coming!” And did they ever. Dozens of them, day after day. I went to Evanston myself on a raw and rainy Sunday morning, about two weeks after the avian celebrity first arrived. An hour went by, and my toes were going numb as I waited under a golf umbrella, my binoculars pre-focused on the platform feeder. Then, like magic, a male varied thrush appeared, filling my 8x42s. What a beauty! That moment was well worth the 35-mile drive from Glen Ellyn and my cold, lonely vigil in the alley. I really couldn’t imagine a better bird to claim as No. 500—certainly more meaningful than a red-whiskered bulbul would have been. The “quality” of a milestone bird is important, at least to me. The varied thrush was still enjoying life on Cleveland Street a full month after the first sighting. It might stay a good while longer. For a rare bird, this one’s about as sticky as they get. A cool thing happened in January when I least expected it. While walking from the Glen Ellyn YMCA to the Walgreen’s next door I noticed that the neighboring water detention area was full of ducks. All mallards was my first impression, and they were clearly enjoying the open water on this unusually warm winter morning. I paused for a moment to count them and then realized there was an imposter. Mixing with the four dozen greenheads was a single American black duck! Black ducks are not uncommon in DuPage but they are not “everyday” birds either. It was a pleasant surprise to see one so close when just going about my usual routine. Experienced birders know to expect the unexpected, and that’s a smart way to approach the hobby if you want to see new birds. There might be an uncommon species or even a mega-rarity in our midst but it takes a careful and patient observer to detect it. Spotting the black duck was easy. The temporary pond was tiny so the birds were in close quarters. And while blackies are closely related to mallards they are not hard to tell apart. With other waterfowl, that’s not always the case. Some birders like to examine massive flocks of foraging Canada geese in hopes of finding a cackling goose. I seldom have the patience for this activity but I admire those who do. One such person is my friend Don, from Wheaton, who once pointed out a cackler during a Christmas Bird Count at Cantigny. We were on the golf course and trying to estimate how many Canada geese were grazing on the turf. Don then noticed that one of the birds was notably smaller, with a short neck and stubby little bill. Sure enough, it was a cackling goose—a Canada goose lookalike. It was a new species for my life list and I’m quite sure I’d never have found it on my own. On the topic of geese, you might have heard about the barnacle goose that turned up in Yorkville last fall. 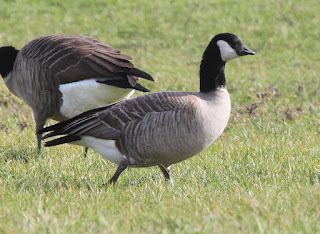 That too was a case of somebody being observant and not assuming a goose flock was “all Canada.” The barnacle was a life bird for many who chased after it once the discovery was reported on the Internet. If a barnacle goose or a cackling goose is flying with a flock of Canada geese then it would likely go unnoticed. Still, passing V formations of geese are still worth a scan. Occasionally you might notice one goose that is white with black wingtips. What you have then is a snow goose—or possibly even a Ross’s goose, since they look alike from afar. Flocks of sandhill cranes should be checked carefully, too. Whooping cranes sometimes travel with the sandies and are easy to pick out since they too are white with black wingtips. A few whoopers were witnessed in DuPage last fall. More than a decade ago I drove to Jasper-Pulaski Wildlife Area in Indiana to see a vagrant common crane—a Eurasian species that rarely visits the United States. The gray bird was mingling with hundreds of sandhill cranes (also gray) way out in a field of corn stubble. How anybody spotted that bird in the first place was a miracle. Excited birders reported a couple other “needle in a haystack” stories recently at Chicago Botanic Garden in Glencoe. In both cases, the birds involved were far smaller than ducks, geese or cranes. CBG is well known as perhaps the most reliable place in this region to find common redpolls, a coveted winter finch that favors the birch trees outside the garden’s Regenstein Center. In January, a locally rare hoary redpoll was found mixing with the flock. I have never seen a hoary. In fact, one could land on my shoe and I’d probably still call it a common. The two species are virtually identical, making this one of the tougher identification challenges in birding. Another rare winter visitor to watch for at CBG is Bohemian waxwing. Like redpolls, cranes and geese, waxwings are usually seen in flocks. In this region that means cedar waxwings, one of our more beautiful local birds. But every so often a sharp birder will notice that one of the cedars looks a little too chunky. That’s the first clue that it might be something special. Bohemians are also grayer overall than cedars and sport a dark-orange patch under the tail. The undertail coverts on a cedar waxwing are white. The lesson here is that closely related species often spend time together. When you encounter a group of birds that appears to be of one species, never assume that is the case. Take a few minutes to scan the flock. With luck and patience, you might be rewarded. Copytight 2013 by Jeff Reiter. All rights reserved.